#1 New York Times bestselling author Tom Rath delivers a fascinating read that will change the way you look at your family, friends, coworkers, and significant other. What’s the quickest way to ruin a friendship? Can bosses actually learn something from marriages? Are very close friendships in the workplace such a bad thing? These are just a few of the questions that #1 New York Times bestselling author Tom Rath asked when he embarked on a massive study of friendships. Along with several leading researchers, Rath pored through the literature, conducted several experiments, and analyzed more than 5 million interviews from The Gallup Organization’s worldwide database. His team’s discoveries produced Vital Friends, a book that challenges long-held assumptions people have about their relationships. And the team’s landmark discovery — that people who have a “best friend at work” are seven times as likely to be engaged in their job — is sure to rattle the structure of organizations around the world. 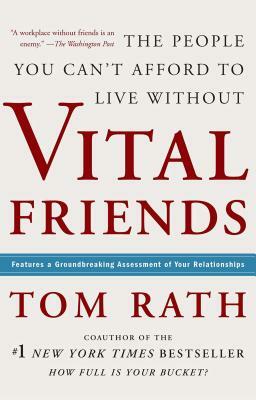 Drawing on research and case studies from topics as diverse as marriage, management, and architecture, Vital Friends reveals what’s common to all truly essential friendships: a regular focus on what each person is contributing to the friendship — rather than the all-too-common approach of expecting one person to be everything. The book includes a unique ID code that provides access to the Vital Friends Assessment and website. This groundbreaking test reveals which friends play each of the eight vital friendship roles in your life. Tom Rath’s fast-paced and inviting storytelling takes a mountain of important research and makes it remarkably accessible and applicable. By the time you finish reading Vital Friends, you’ll see your family, friends, coworkers, and significant other in a whole new light. "A workplace without friends is an enemy." "Friendships are good for business. Companies are coming to discover that, yet are at a loss at what to do about it. . . . what Gallup has uncovered about best friends stands out as novel." "Let friendship ring. It might look like idle chatter, but when employees find friends at work, they feel connected to their jobs. Having a best friend at work is a strong predictor for being a happy and productive employee."